Wow, we have not done one of these for a very long time, but something happened that makes me think that we need to talk about it. We like crowdfunding here at The Torch EG, we actively seek, admire and showcase projects that we think are worth your money. I am not going to into the crowdfunding because AtomP is covering that in his upcoming articles. What I want to talk about is Yogventures by The Yogscast. There is a ton of speculation going around and while I want to go through all that speculation, I will present the ones that are closer to the facts. I became aware of Yogventures back in 2012 when this whole thing started. I am a Yognaught, I like their stuff and watch them. Yogventures got $567,665 in its Kickstarter going way over its $250,000 target. ‘Yay, great, good for them’, I thought. I never backed the project, I didn’t have the money to at the time, and by the time I got to the page, it was already over its pledge. I was more than happy to pay for the game when it hit shelves, so the waiting began. Now, I am not that video game savvy. I love video games, I love playing them and looking up Let’s Plays and Walk-throughs. But when it comes to the time it takes to produce a game, I have no clue. By mid 2013 I started to forget about Yogventures and I remember watching a Minecraft video for Sips, Sjin and Nilesy when a thought came to me. ‘Didn’t The Yogscast have a game coming out?’ I went searching for it, looking for any sign of a release date, or progress. The last progress I saw, after searching the Yogscast website (which turned up little to no information except someone asking when their backer reward would arrive), was on the Kickstarter page, which proudly announced that Beta had begun. ‘Brilliant! Should be out by the end of the year? Next year maybe? Hopefully!’ I started to speculate that Yogventures was not going to happen when Yogscast never mentioned it again, and the Kickstarter page wasn’t being updated regularly either. That was until I visited Facebook a few days ago and found out from Polygon, no less, that it was cancelled. So what happened to Yogventures? What happened to the Beta? What happened to all the game play and all the stuff that we saw in videos? Most importantly, what happened to the Half of a million dollars that their fans gave to them? So basically, they didn’t have to resources to make the game, the game play that was presented may have not been real game play, just concept ideas. But what worries me is the statement, ‘ and no funds to hire one’ wasn’t that was the Kickstarter money was for? What happened to all the money that was donated then? Amazon and Kickstarter took about $150,000, then contracts stated that artists working on the project would have an advance payment of $35,000 each so over $210,000 paid. Of that money One artist who previously worked with Dreamworks, quit the project after only two weeks and was not forced to repay the money because of a loophole in the contract When that happened, The Yogscast took over stating that they didn’t trust me with the money. They wanted to take all the remaining money but agreed to take only $150,000 to sent out all physical rewards to the backers. However only $50,000 was budgeted for the rewards and $100,000 for a lead programmer that not been hired. leaving only $55,000. That money was meant to go to one intern, legal fees, accountant fees, $15,000 was to go to hard ware, $15,000 to buy Unity assets, and $5,000 in software licencees. Only a few weeks into the project and that money was gone. According to the comments from the Kickstarter page, No one relieved any physical rewards that was promised to them through this Kickstarter page. No one, not even those who had physical rewards like T-shirts or Posters, not even those who pledged $10,000 each for lunch with the Yogscast. We’re not ready to make a detailed statement about what happened with Yogventures. Winterkewl’s statement omits much and I would disagree with a number of points, but there’s no value in going into detail. Our only goal right now is to ensure that we provide the best possible experience for the backers that we can. I can honestly say this has been our goal throughout. They go on to say that it was all Winterkewl’s fault, they have nothing to do with funding or decision-making towards Yogventures of any kind. The Yogscast are trying to distance themselves from the developers Winterkewl, using the fanbase they have developed over the years to throw their business partners under the bus and have them take the blame for everything failing. They failed to protect their fans and that the morality behind the whole fiasco is all wrong. it is the responsibility of The Yogscast not Winterkewl to make sure that all went well with the project. Keith also noted that TUG developer Nerd Kingdom now has the assets and source code for Yogventures, and will be picking up where Winterkewl left off. Physical backer rewards have already been shipped out, with in-game item rewards being developed by Nerd Kingdom to match what was promised as closely as possible. There is no doubt that this had The Torch EG buzzing for the past few days, but what are our thoughts on the subject? There is tons of speculation going around us little blog as well. Mainly its that The Yogscast should have been more decisive. At the early stages they pulled over a quarter of the funds, stating they should have control over the whole budget, yet at the moment of cancelling, when they had all assets, they state it was always Winterkewl Games’ project and push the blame to them. Winterkewl Games should have been more forceful when Yogscast wanted to pull the funding and not let them walk away with the 100 000 that was supposed to go to a lead developer, the very backbone of the whole project. Most of all, both parties should have been more vocal on the subject long before now. It’s only now that we know what happened and that it all failed due to one single incident 2 years ago. One single incident including an artist… when Yogscast themselves have almost lived entirely on donated artwork since the beginning… and still do. We all agree here at The Torch EG that if anyone had mentioned something earlier instead of keeping everyone in the dark, there’s a high probability that they would’ve gotten the work done for free or cheap by the community. They have to responsibility to their fans and when they saw that everything was going down hill they should have let us in on it, let us know what was happening and not hide it all away. We have been in the dark for two years and now we are completely crushed by this new development. Stating that: ‘ they have no obligation to the Kickstart page’ its pure bull. Fair enough, yes, maybe they have no obligation but It was a Yogscast Brand, it had the Yogscast name and people behind it. Yogscast promoted it, it is Yogscast’s voice on the Kickstarter page, and when we look at the it, we see Yogscast NOT Winterkewl Games. Whether it is the fault of Winterkewl or not, Yogscast are to be held responsible because it is them we associate Yogventures with NOT Winterkewl. To be honest they are both at fault. This is even worse when you hear what happened to Kris Vale and Winterkewl, shifting the blame onto them is not only complete bull but undeniably cruel. A Man’s life has been completely ruined by this project and instead of doing what is right and accepting the blame because ultimately the Yogscast fan’s will forgive and forget, maybe. They pushed it even further on it Vale and Winterkewl. That is just cruel. 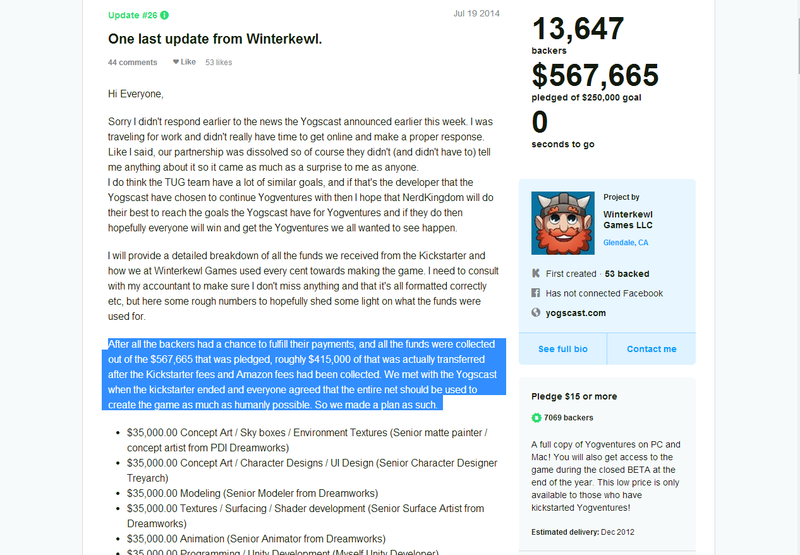 Utlimately Kickstarter projects are risky business Yogscast is just the latest one to fail. It has happened before and it will happen again. It is a risk. And one more thing: Whatever happened to the $100 000 that Yogscast took to look for the lead developer? Do you have your own opinions of the matter? Let us know in the comment section. I never liked the idea of the game. It smelled to much of a ‘cash-in’ of the Yog’s popularity. But YouTubers (ChimmnySwift11 to name one at the time) was Kickstarting for stuff too so I just thought to each their own. Still do. If people willing to pay to advance a YouTuber or the like to make more advanced or different stuff, then so be it. But reading more and more about this it feels like no one involved knew what they where doing. Yog’s under thought how much money it was going to cost and how long it would take. Winterkewl was to willing to part with money and aimed for highly experienced (and expensive) staff, and they still under staffed themselves. This feels to me like a failure from start to finish, from planning to inception to its demise. And no one is going to come out of this clean. The Yog’s reputation will take a big hit from this debacle. But this is the risk of ‘Crowd Funding’. No matter how big the company/group or how much money a project has, there is always a risk of it burning out and failing on a huge scale. Sometimes, you just can’t tell when a project is doomed to fail or not.